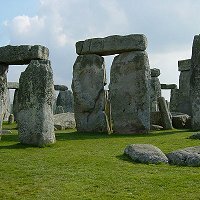 Stonehenge To Get Facelift: English Heritage said that the £27m project to build a new visitor centre out of sight of the stone circle to replace the shabby collection of buildings beside the monument and to close a nearby A road was under way. English Heritage said that the £27m project to build a new visitor centre out of sight of the stone circle to replace the shabby collection of buildings beside the monument and to close a nearby A road was under way. After nearly 30 years English Heritage finally has a scheme that will transform the setting of the stones and our visitors' experience of them. The restoration of the landscape together with a major new exhibition on site will finally give our greatest and most famous monument the treatment it deserves. The project, developed with the support of the National Trust, Wiltshire council, the Highways Agency, and Natural England, will transform the setting of Stonehenge. The section of the A344 that runs past the monument - almost touching the heel stone - will be closed and grassed over, reuniting the stone circle with the surrounding landscape. A remaining part of the road will be closed to public vehicles, and will become the route of a new visitor shuttle service to the stones.